The latest release from Awesome Tapes From Africa, the label that does exactly what it says on the tin, is my favorite of theirs thus far. This album dates back to 1994, the year of South Africa’s first free elections. Penny Penny, a Tsonga from Limpopo, was working as a janitor for a record company in Johannesburg when he cut these sides with producer Joe Shirimani. These two men caught two big waves -- first the boom in kwaito (South African house music) which remains popular today, and second the increased interest within South Africa in the languages and culture of its own ethnic minorities. Shaka Bundu was a multi-platinum hit in South Africa but went pretty much unheard in the USA and Europe until now. 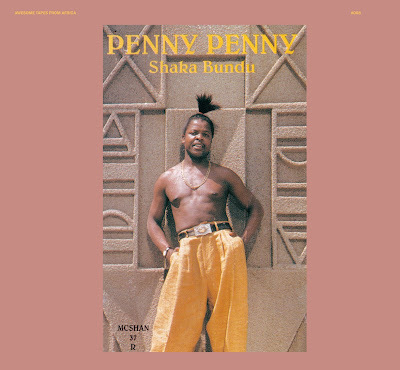 It’s a delightful blend of house and what South Africans call “Shangaan disco” (the antecedent of today’s fabulous “Shangaan electro” sound) – a firm slow-to-midtempo four-on-the-floor beat, soulful female vocals, synths emulating steel drums and bird calls, frequent break-beats, and Penny Penny’s hoarse chanting. If this doesn’t have you up and dancing, better check your pulse: urban South African pop just doesn’t get any better.